The other day, while waiting for the girls in front of the Matsukata House with Pippi, an unnamed school administrator asked me to give David this door prize from the school's recent golf outing. Intrigued by the box and its mysterious contents, I happily obliged but blanched when said official informed me that it contained "some plastic wrap I could use in the kitchen." The girls were horrified when they heard this! Where-oh-where was my snappy come back??? But let's put that sexist comment aside. There was something about the arrangement of the goods inside that caught my eye. In part it was the graphic design -- direct and to the point in a clinical sort of way. In part it was the artful orchestration of boxes of various shapes and sizes, each one tailored for function and space efficiency. And in part it was the vivid, primary colors -- lemons yellower than life, bagels (yes! bagels!) appealingly light brown and strawberries so red and luscious they practically jump off their cardboard, kurerappu box! 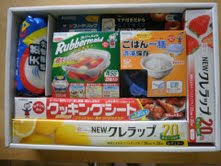 While some of the products are intended for re-use, the bulk are tsukai-suteru items, i.e. disposable. Left to my own devices, I make an effort to cut down on future landfill. In some ways Japan makes this easy since size appropriate food storage vessels are readily available -- there is a designated shape for every major food product, big or small. In my kitchen drawers alone there are individual soy sauce dispensers, triangular containers for rice ball transport and, thanks to a thoughtful friend, a deep, plastic box configured perfectly for a loaf of Japanese bread.